Curated by Carly: "Rose is a rose is a rose is a rose..."
"Rose is a rose is a rose is a rose..."
I'll admit it: I'm a perfume hoarder. I've tried every kind of perfume there is, but I just haven't been able to find a scent that I'm madly in love with. 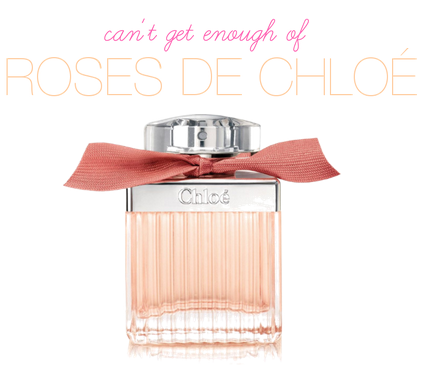 That all changed this week when a sales associate as Sephora showed me Roses de Chloé. It's scent is timeless and romantic: fresh cut roses, bergamot, rose essence, magnolia accord, white musk and amber. It reminds me of my trip to Paris, smelling all the fresh flowers being sold on the street by Parisian vendors. I think I've found my signature scent for life! That sounds delightful! I'll have to stop by Sephora soon... You should look into the Prada Candy perfume as well! It smells so good. Oooh I'll have to try it! I'm going to need to go get a new perfume soon and I usually stick with Dolce & Gabbana "The One" or Burberry but this sounds delightful! I will definitely have to try this one out! I've been using Barr & Co. because it has a very clean scent, but this sounds like it would be perfect for date nights.